Dear Scarlett by Fleur Hitchcock was recommended to me by one of my Year Five readers at school. The children I listen to regularly are a great bunch, and generally introduce me to a wide variety of books I have never come across before, in amongst the usual Wimpy Kid and Tom Gates offerings. I don’t get time to read everything they tell me about, but this book was particularly intriguing and also published by Nosy Crow a growing independent publisher whose development I’ve been following with keen interest. Dear Scarlett tells the story of eleven year old Scarlett. Scarlett’s dad died about five years before the story starts, and Scarlett believes that he was a thief who spent most of her childhood in and out of prison. As a result her memories of him are few, and rather confused. She gets teased a lot at school about her criminal father and feels pretty conflicted about his legacy, such as it is. A few weeks after her eleventh birthday a man appears on Scarlett’s doorstep saying that he was Scarlett’s father’s solicitor and he had been instructed to give her a box of items from her father when she turned eleven. Scarlett is intrigued, and doesn’t know what to make of the strange collection of postcards and other memorabilia that her father has left her. Soon after the box is delivered a series of strange events happen to Scarlett, some of them frightening, and Scarlett is led to believe that her father has left her a trail of clues to follow, but what exactly are they, and what will solving them lead to. This is a great adventure story which ties in rather beautifully with Scarlett’s newly blossoming understanding of her father and her relationship with him, and her relationship with her mother’s new boyfriend and his daughter. I loved the way the author deftly juggled the kind of theme a Jacqueline Wilson novel usually deals with, and leavened it with the adventurous nature of Scarlett’s quest. It really perked up a rather tired genre and gave it new places to go and things to say. As well as being a bit of a breath of fresh air in terms of publishing that will primarily appeal to girls, it is also very well written and extremely engrossing. There are a few elements of rather surreal humour which were startling, such as Scarlett’s relationship with her horrible teacher Mrs. Gayton, and her trials and tribulations trying to rescue some penguins from the local zoo. The book really does have something to appeal to every reader, but without coming across as too cluttered. It is to the author’s credit that the story hangs together well and each element works. The book is clearly marketed at girls, which is a shame because the adventure elements are strong enough that the lack of boy characters wouldn’t be too much of a problem if you could just get a boy to try it. It’s the sort of book you’d have to read an exciting bit out of in class or at home, and hope that any boys who are interested enough can overcome the girl friendly cover. I’d recommend it to confident readers aged 7-12. It would make a lovely bed time story to share with younger children or with older children who still enjoy being read to. Boyface and the Uncertain Ponies by James Campbell is a book I picked up from the library for my son, Oscar last week. It looked like the kind of book he would enjoy. The synopsis read like a mash up of Andy Stanton’s Mr. Gum books, and John Dougherty’s Stinkbomb and Ketchup-Face series, both of which he adores. He has caught up with both of these sets of books, and is always on the look out for a new series to enjoy. This is one of four books in the Boyface series currently available, and I had high hopes that he would be delighted. He has not been, sadly. In fact, he read two chapters and then gave me the book back. I was quite surprised, so set aside an hour to read it last night to see what it was that didn’t work for him. He didn’t hate it, by the way. He just said it was ‘alright’, but not really for him. From my own point of view, as an adult reader, and we always have to bear in mind that what adult readers think is marvellous, children often don’t, I found it fairly disappointing. It tells the story of Boyface and his parents, who are Stripemongers. Stripemongering involves, for the most part, passing animals through a sort of quantum machine that alters them into other things. The machine can also be used for the purposes of interior decoration. In this story, Boyface’s dad has picked up a load of cut price zebras from someone down at the docks. He and his family have been putting them through the machine to remove their stripes, and then selling them as ponies. As the story opens, many of the ponies are glitching, forgetting they are ponies. Sometimes they turn back into zebras, sometimes other things. It is up to Boyface and his family to figure out what has gone wrong and fix it before they get lynched by the local population. The elements of surreal comedy that work so well in Mr. Gum and Stinkbomb and Ketchup-Face are all there, but they just don’t seem to gel so coherently. The opening of the first chapter smacked of a pastiche of Mr. Gum but without the sharpness and ear for language that allowed Andy Stanton to pull it off. In fact, there are a few places in this book where the sentences simply don’t make sense. I was not entirely sure whether this was down to the author or the proof reading. There are some wonderful episodes. I liked the list of things that Boyface was allowed to do when he entered the family business, and the Tartan Badger is a great character, but there is so much going on here, and so many characters and interludes, and asides that the narrative sometimes gets lost and in the end seems secondary to the idea of cramming the book with as many hilarious jokes as possible. I also found the section where Boyface’s friend Clootie Whanger (and the word Whanger here, is somewhat suspect, frankly), talks about her unhappiness at school, quite jarring. It was beautifully realised and a really interesting line of narrative, which then gets abruptly cut off, and doesn’t seem to fit the rest of the book at all, sitting uncomfortably next to its surreal whimsy. I doubt, frankly, that these are the reasons my son didn’t want to continue with the book. He just didn’t think it worked for him. I suspect it might work for other children if they like the kind of books I’ve mentioned in this review. I would recommend it for confident readers aged 7-10. You could read it aloud to younger children as a funny bed time story. Each chapter is fairly short and they are divided into zebra ‘stripes’ rather than chapters. The illustrations by Mark Weighton are good and there are lots of them. It would make a good transitional or chapter book, particularly for reluctant readers. The book has lots of silly humour that will appeal, along with some rather rude sounding insults that will delight a child’s heart. Regular readers will be well aware of my enduring love for Chris Riddell, both as an author and an illustrator. His most famous work is probably alongside Paul Stewart as the co-author of The Edge Chronicles, but his work ranges far and wide, and some of my favourites of his books are the Ottoline series. Published in the same format as his award winning Goth Girl series, but published much earlier on in his writing career, there are three books, of which Ottoline and the Yellow Cat is the first. My son recently finished reading the Timmy Failure books and needed something new to read for school. He was feeling rather dispirited and out of inspiration, so I suggested he might want to try Ottoline and the Yellow Cat. Initially he was quite disparaging of the idea, but he changed his mind about ten pages in, and has read the entire book in two days. He is now starting on the sequel. The books are A5 sized, and nice and chunky to fit a child’s hand. They are full of amazingly detailed drawings by Riddell, many of which are annotated and hold clues, jokes and even sometimes sub plots of their own. Ottoline is a resourceful and independent child. She has to be, as her parents are world renowned explorers, and are often away on trips. While they travel, they leave Ottoline in the capable hands of dozens of home help businesses including McBeans’ cleaning service and a professional pillow plumper. They also leave her with Mr. Munroe, a small, hairy creature they rescued from a damp bog in Norway, and who is Ottoline’s best friend in all the world. Mr. Munroe detests having his hair brushed and being wet. He eats only porridge and hot chocolate, and is not very good at keeping his room tidy, because bogs in Norway don’t really have rooms. Ottoline, as well as collecting unusual things like her parents, is also good at solving mysteries. In this story a spate of lap dog and jewel thefts is rippling through the neighbourhood, and Ottoline, with the help of Mr. Munroe and a large bear who lives in the basement and steals people’s washing, sets out to save the day. The story is hugely quirky, very intriguing and has lots and lots of humour, both in the writing and the illustration. It is an absolute joy to read. We recommend it to boys and girls aged 7-12. Dragonory is a collection of folk and fairy tales from around the world compiled by story teller supremo Pie Corbett. Some of the stories are retold by Pie, but there are lots which are by other story tellers if Corbett doesn’t float your boat. The stories are designed for seven to nine year olds, either to read alone or aloud. The way they are written, however, is very much aimed at them being read aloud. Quite a lot of the stories are prefaced with traditional story teller openings and endings, which are part of the oral rather than the read tradition, and it is true that they are excellent fun to read aloud. This has been another one of Oscar’s reading books this term. When he arrived home with it, I was slightly daunted. It is fairly long for a reading book (about 180 pages), and some of the words and concepts in the stories are tricky. There are lots of made up words, difficult to pronounce words etc. I thought he would get bogged down in the stories, and bored by them, which is not something you want when you’re trying to enthuse a child about the magic of reading. I cannot tell you how wrong I was to worry. Firstly, the length of each story means that even if you don’t like a tale, you won’t be reading it for too long. The shortest come in at a couple of pages, the longest at about twenty. The subject matter is very diverse too, so there is plenty to entertain. The stories have lots of humour and adventure, and are all nicely paced so that you are drawn along through the narrative, actively wanting to find out the punch line, or what happens next. We ate this book up. It was an absolute joy to read. Oscar read me two stories every night until it was done, and by the end of it, the whole family were sitting around to listen and share the tales. It made Oscar feel pretty special that he was able to keep us all entertained like that and did wonders for his reading confidence. There were tricky words he stumbled over, but we figured them out and he was more than willing to tackle them because he was as sucked into the stories as we were. We enjoyed it so much I am actually going to buy a copy of this book for home. As the title says, these stories are aimed at seven to nine year olds. I’d say they would work equally well up to the age of twelve. I would also say they would be perfect for bed time reading for younger children or for reading in class if you’re doing a topic on folk or fairy tales. They work equally well for boys and girls and the whole book is an absolute delight. Spider McDrew by Alan Durant has been another one of my seven year old’s reading books this term. It is from the Roaring Good Reads series by Harper Collins, specifically designed for use in schools. There are three or four Spider McDrew books available. Spider McDrew was going to be another Horrid Henry spin off, I decided as I read the synopsis; slightly troubled boy, has difficulties at school etc. It turns out I could not have been further from the truth. Spider is a very different beast from Henry. As far as I’m concerned this is no bad thing. These three stories show how hard it is to be someone like Spider, and also what is going on in Spider’s head. They show the reality of the trickiness of Spider’s existence, but the joy of the stories are that they ensure that whatever scenario Spider is put in, he always manages to come out on top despite himself. I love the fact that Spider has a supportive, gentle teacher who squashes the class when they get too mean to Spider, and I liked the way the author drew the complicated but loving relationship between Spider and his mum. In this book, Spider plays football, takes a cow to school and accidentally becomes the star of the school play. The stories are short and easy to read if a child is a fairly competent reader. There are plenty of black and white drawings to break up the text and it is a perfect transitional text for readers aged between seven and ten. It works for both boys and girls. There is enough humour in the books to make them appeal to children without them being too soft and mushy, and the thoughtful nature of what the author is saying about children who are different will probably be absorbed unwittingly by the children, which is no bad thing. I liked the fact that these books are specifically aimed at newly confident readers and has been checked so that it is suitable for schools. Finding these kind of books can be tricky sometimes and Harper Collins have done all the work for you with the Roaring Good Reads series. I was particularly pleased by the fact that although they are meant for an academic environment they do not look like ‘reading books’, which makes them much more appealing to children. Charlie and The Great Escape by Hilary Mckay is one of a series of books about the eponymous hero, Charlie. My son was given this as his first reading book in his new school. Prior to this we had never heard of Charlie, but after reading it, I am sure we will be going to our local library and finding more in the series. The Charlie books seem perfect if you are a fan of Horrid Henry. Charlie is very much a Henry figure. He has the same lack of awareness that the things that he does and says are rude and/or naughty. There are however, differences which make Charlie and his adventures a much more appealing prospect to me. Firstly, Charlie’s family are under no illusions about his behaviour, but unlike Horrid Henry’s parents they do not blatantly make a favourite of Charlie’s brother, like Henry’s parents do with Perfect Peter. Nor do they insist that everything Charlie does is terrible, or that everything Max does is wonderful. They seem like more realistic, more affectionate people than Henry’s parents. I hate the way Henry’s parents are so blinkered when anyone with half a brain can see that Perfect Peter is just as vile as Henry in a different way. Secondly, there is a real sense that Charlie’s family love him very much, despite the antics he gets up to. They get cross with him, as they should, but they also seem to make the distinction that Charlie is not the total sum of his actions. This is clearly illustrated in this story in which Charlie has an incredible run of bad luck and does so many awful things that his mum loses patience with him completely. Charlie decides that he is utterly unappreciated and decides to run away, firstly to the gap behind the shed in the garden, and then on to his best friend’s house. It is obvious from the outset that Charlie’s mum and dad know exactly where Charlie is, but the humour of the story comes from them playing along with Charlie so that he can see for himself what it is like to be without his family. It is not done in a cruel way at all, and I love the way they lure him back to his home with them. The story has lots of funny moments that made my son laugh out loud. It would work well for boys and girls, although marketed more at boys. I would recommend it for newly confident readers aged 7-10 if they are reading alone, but it would make a fun story to share with younger readers if you are looking for a funny bed time book, or a book to share with the class. The chapters are short, with clear font and plenty of white space between lines and paragraph breaks. There are good black and white illustrations and the text is not too challenging for a good reader who is not afraid to have a go at the odd tricky word. It arrived a couple of weeks ago, and I’ve been looking for a quiet evening to settle down with it. I’ve just finished it, and I have to say that it was not a disappointment. In fact, I think I enjoyed it a little more than the first book, partly because the characters are beginning to bed in nicely now, and there is a chance, in the second book, to develop sub plots that were only just germinating in the first book. The series tell the story of Joe, a young boy who has his life rudely uprooted one day when he arrives home from school to find that his parents are not the boring, ordinary parents he had long thought them. In fact, they are super spies. Their cover has been blown, and with Joe they must go on the run and make new identities for themselves. In order to protect themselves better, they decide that Joe must become Josie, and suddenly Joe gets to experience wearing dresses, having pinkness thrust upon him and being called all sorts of nauseating pet names. He hates being a girl until his burgeoning friendship with tomboy, Sam, makes him see life a little differently. And of course, he gets inadvertently pulled into a case. In this second book, the themes remain the same, Joe is still Josie, and just as he is beginning to feel pretty comfortable in the existence he has carved for himself, his parents spring upon him the chance to earn his spy stripes. He jumps at it, only to find that going undercover at the local leisure centre in order to find out who is planning to steal the world famous football memorabilia from their exhibition, will require him to take intensive ballet lessons. The stories are very, very silly, although I like the fact that at heart they deal with pretty sensitive stuff. They force Joe to see what it is like to be a girl, and how it’s not all sweetness and light. In ballet for example, he finds that it isn’t quite as wet as he imagined, and it might even help his football skills. I love the fact that his friendship with Sam becomes deeper and more interesting too. The action is fast paced, and the book is a real page turner. I finished it in just over an hour. For a child aged between seven and ten, the ideal age range for the material, I think they would find it a satisfying read without it being too daunting. There are plenty of illustrations to break up the text, and the chapters are short and attainable in terms of setting reading goals. The language is not too tricky, but it does pose challenges which will stretch a newly confident reader. I would recommend it for both boys and girls. Its humour, its inclusiveness and its gender neutral marketing will work for everyone. I look forward to reading the third instalment, Boy in Heels. The Mark of Athena is the third of five volumes in the Heroes of Olympus series by Rick Riordan, the follow on series from the original Percy Jackson and the Olympians series. My children and I have been steadily reading these, one after the other, and this makes our eighth journey into the amazing mythical world Rick Riordan creates. In this series we get an intriguing blend of both Greek and Roman history and mythology, brought slap bang up to date in the modern world. It is a winning formula that so far hasn’t become tired for any of us, either me as the reader or they as the listeners. In this story, Annabeth takes centre stage, journeying to modern day Rome with her six friends in order to find the long lost statue of Athena that it is prophesied will help bring an end to the impending Titan war. Having said that, other characters get their fair share of pages too, to advance their own narratives, which given the book is about seven hundred pages long is fair enough. We particularly love the character of Leo. He’s such an appealing character and we love the way his narrative interweaves with that of Hazel and Frank. We were a little sad that Ella, the harpy didn’t really feature in this book, but we’re sure she will turn up in the next volume, which we’re already several chapters into. The books are fantastic for confident sole readers aged about eight and up, particularly if their interest lays in the world of myth and magic. The language is quite technical, so struggling readers will find this challenging, particularly with the length of the book giving them no respite. It is equally appealing to both boys and girls, having strong characters of both sexes and a great story line that packs punch after narrative punch and really keeps you hooked. You will need to read these stories from the beginning to get the most out of them. 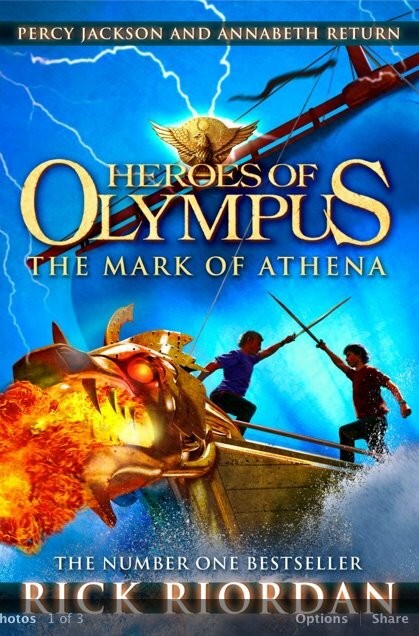 Ideally you should start way back at the beginning with Percy Jackson and the Lightning Thief, but otherwise you will need to start at volume one of the Heroes of Olympus series, The Lost Hero. Outcast by Michelle Paver is the fourth of six volumes of The Chronicles of Ancient Darkness series which features the boy hero Torak, his companion Renn the reluctant mage, and the magnificent wolf cub who is more pack brother than pet to Torak. My seven year old son and I have been reading these books since the beginning of the year and loving them. The formula for each book is the same, with Torak, Renn and Wolf facing some kind of danger which not only risks their own lives, but the lives of their tribes and by association the whole of the world they know. The books are set in a kind of fantasy stone age with tribes based on their skills, their totem animals and the places they inhabit. The world is infested with demons and spirits that must be fought and/or propitiated in order for the order of nature to remain in balance. The story line is an overarching narrative that takes place over the entire six books. You really do need to read them from the beginning in order to make any sense of them, so please don’t start here. Go back and begin with Wolf Brother if this sounds like your sort of thing. The books are written for children aged between 8-12 I suspect, although they are quite dark and emotionally challenging enough to appeal to older children. My son loves them, but I suspect that were he reading them by himself instead of me, he wouldn’t be enjoying them as much because the books are full of quite complex ideas and tricky words which he might stumble over, and which would undoubtedly upset the flow of the narrative for him. As it is, I read, he listens and then we talk about it, which works for both of us. The characterisation is wonderful. We particularly love Wolf, who is utterly brilliant in his own right and steals every scene he is in. The books would work equally well for girls and boys. The main character is male, but Renn is a strong female figure who gets some really juicy story lines of her own and who helps to create a well rounded balanced book that will appeal to both sexes. The books can be quite violent and rather frightening in places so if you think your child may be a little traumatised by them it is best to perhaps wait until they are a little older, or do what I do, and read with them so that you are on hand to see how the material is received.